The entire structure of this gas barbecue is made of high-quality steel in a paint coating with high resistance to heat. The stainless steel burners are durable and safe; they are rust resistant. 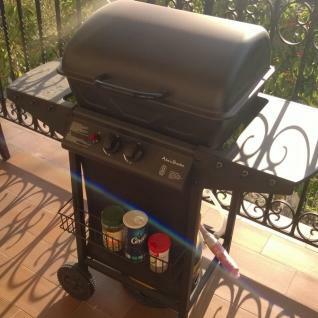 With this gas barbecue, discover the pleasure of a quick ignition! The two burners can operate independently and have large buttons for easy use. They are equipped with Piezo electronic ignition. There are several grills inside the barbecue, an enamelled cooking grill, as well as a grill on top to keep cooked food warm, without continuing to cook them! Caution: to connect it to a gas tank, you need a gas pipe and expansion valve (not supplied).